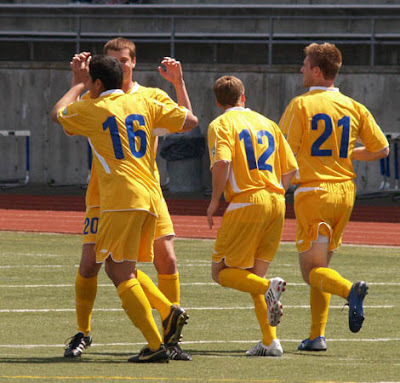 Tide celebrate a goal against Cascade on May 11th. Tacoma Tide FC pick up the race for Northwest Division supremacy tonight as they host the Ogden Outlaws at 7:00 PM at Viking Field at Curtis High School in University Place. Youth players wearing jerseys can get in for just $1. Fans will get free megaphones in tonight's featured give-away. The Tide remain with a glimmer of hope to get into the US Open Cup, but they need to win both tonight and tomorrow night at home against powerhouse BYU. Daniel Scott joins the Tide for his first home match as the new central defender. Scott is a graduate of Gonzaga and his brother Zach is a long-time defender for the Seattle Sounders. Tacoma have not lost at home since 2006. Last year the Tide went undefeated at University Place, and Tacoma won their first home match of 2008 over Cascade 4-0 on May 11th. by GOALTacoma on 5/23/2008 @ 10:33pm Tide-5 Ogden-0! Photos and details on Saturday!